With all of the bad reviews coming out for Suicide Squad, I was actually looking forward to watching this film, because negative reviews are so much easier to write. Unfortunately, it just wasn’t that bad. It’s not something that most audiences are going to watch again, but for the two hours spent in the theater, Suicide Squad is entertaining. In fact, the worst thing I can say about it is that it’s just not exciting, compelling, or memorable. But other than that, it’s fine! Ruthless government official, Amanda Waller (Viola Davis), has a plan to assemble a handful of supervillains into a special taskforce that can stop incredible threats, like a rogue Superman. 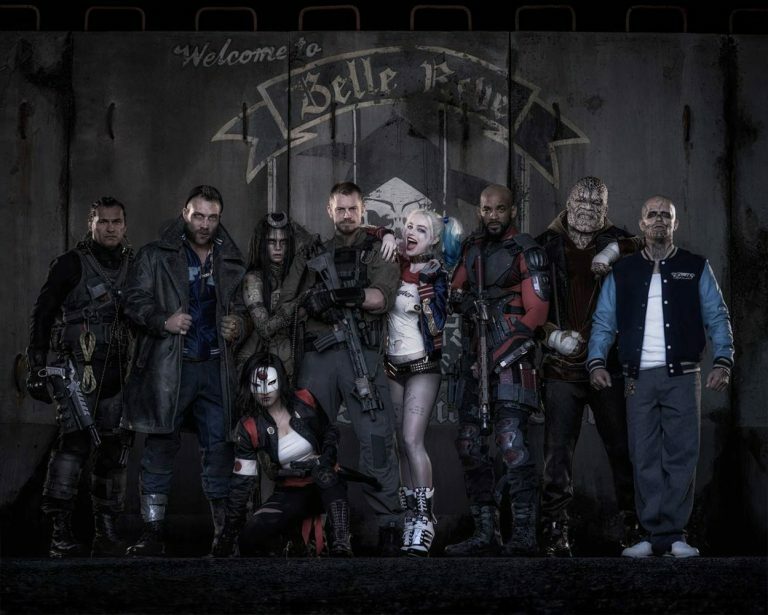 This team consists of Deadshot (Will Smith), a man who never misses; Captain Boomerang (Jai Courtney); all-around psycho Harley Quinn (Margot Robbie); Killer Croc (Adewale Akinnuoye-Agbaje); El Diablo (Jay Hernandez), a master of fire; and Enchantress (Cara Delevingne), a witch with incredible power who has possessed the body of Dr. June Moone. The group is wrangled by soldier Rick Flag (Joel Kinnaman), who reports to Waller, and Waller keeps Enchantress in line by safeguarding the witch’s one vulnerability: her heart, which Waller keeps in a portable safe that never seems to leave her side. Unfortunately, Enchantress hatches a plan to escape her leash and bring total annihilation to the world. It’s up to the Suicide Squad to stop her. Overall, the structure of the film is competent. It starts off with introductions of the squad members and their abilities, with extended introductions for Deadshot, Harley, and Enchantress. With such a large cast of characters that audiences aren’t familiar with in terms of the cinematic universe, the filmmakers did a good job of focusing on a few of them for an expanded story and something that audiences could sympathize with. Deadshot wants to be a good father to his daughter. Harley wants to spend her life with the Joker (Jared Leto). And Enchantress’ human side, June, wants to explore her relationship with squad leader Rick Flag. These dramatic subplots keep the film from being just another average action movie. That’s not to say that a lot of value is added, but the extra texture is appreciated. Suicide Squad does suffer from the same hazards that any film with a large cast does; one of them being not enough important things for individual characters to do. Killer Croc is ostensibly the group’s “strongman”, but he doesn’t do anything that especially highlights this advantage. When he’s finally in his element and able to contribute meaningfully, he does something else instead, leaving it up to a minor character to push the plot along. Captain Boomerang is also a non-entity throughout the film. One would expect him to be flinging boomerangs to great effect in ironic and unusual ways, but he rarely uses them. Another character, named Katana (Karen Fukuhara), has a cool backstory and a sword that traps the souls of those it slays but is otherwise completely unessential to the film. She doesn’t push the plot forward and doesn’t contribute in any vital way to the group. Including these relatively useless characters is probably fan service, but it’s hard to imagine even fans feeling serviced when their favorite characters don’t do much. Margot Robbie steals the show with her performance. Not only is she magnificent to behold – both for her natural attributes and for the great costume and makeup design – but also because she really does everything she can to bring the character to life. It’s plain to see that Robbie has not only developed the character that she’s playing, but also the character that Harley is playing. So when Harley has an unguarded moment lamenting a recent loss, it’s delightful to see another layer peak through the obfuscation for however long the moment lasts. If the Joker had a bigger part in the film, it would have been easy for Leto to outshine everyone else. His portrayal of the iconic character is different than any version audiences have seen before, but it’s different in all the right ways. Again, smart makeup and costume design amplify this role, and if DC gets around to making another straight Batman vs. Joker movie, then I hope Leto gets to reprise this character. Will Smith turns in the weakest performance, playing himself as a person named Deadshot. It’s hard to tell if he’s even acting or if he’s just saying lines with emotion. It’s doubtful that viewers will revisit Suicide Squad outside of comic book junkies. It’s just not that interesting or particularly clever. Characters are bland, the plot is dull, and the action is only so-so with much of the physicality filmed too close to really appreciate what’s going on. It’s really too bad that DC and Warner Bros. didn’t follow the blueprint that Marvel created for comic book films, because Suicide Squad really should have been released much later in the roadmap when audiences were already familiar with these characters. It could have been an intellectual property that Marvel had no answer to. Instead, we have it now, when no one was asking for it and when it makes the least sense. For shame.